Potato rosemary focaccia recipe with step by step photos. 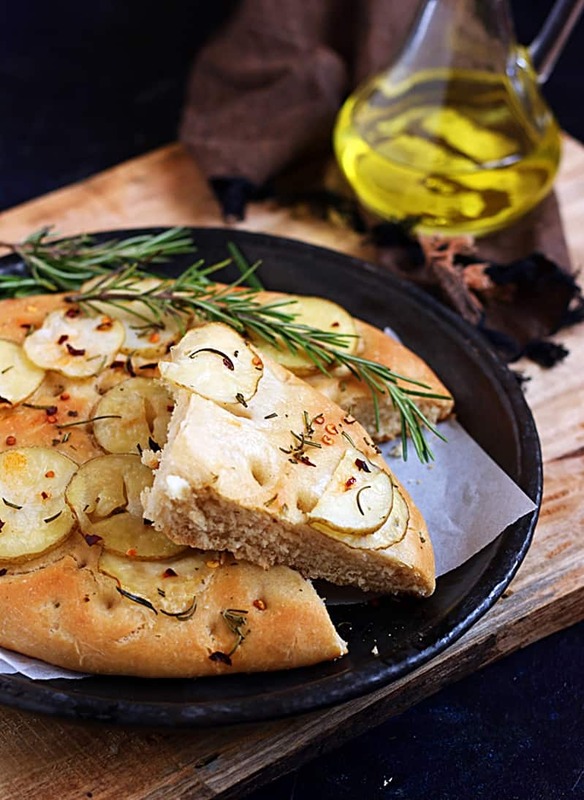 Today I am sharing a very delicious and flavorful focaccia recipe with potatoes and fresh rosemary. Last week I spotted fresh rosemary in store and I was really excited. I immediately picked it up and tried few recipes that I had in my to do list. I have made focaccia recipe many times, In fact it is our favorite bake and do many variations in it. I saw this potato rosemary focaccia recipe in a cook book and liked it very much. I thought of trying it with dried rosemary but when you have fresh herbs in hand nothing like that right. If you like potatoes and bread, this potato rosemary focaccia recipe is a must try for you. Soft and spongy bread topped with thin potato slices and fresh rosemary sprigs, this focaccia is a real treat. To make potato rosemary focaccia recipe I have used whole wheat flour. You can use maida if you prefer. Try using good quality olive oil for awesome flavor and taste. If you do not have fresh rosemary in hand you can use dried rosemary. You can even use parsley instead. Serve potato rosemary focaccia warm with a soup for a nice comforting meal on a cold day. Here is how to make potato rosemary focaccia recipe with step by step photos. 1.Take 1 cup luke warm water in a bowl. Add 3/4 tablespoon sugar and mix well. Sprinkle 3/4 tablespoon active dry yeast over it. Let the yeast get activated. In the meantime add 1/2 teaspoon chili flakes, 1/2 teaspoon minced garlic in 3 tablespoons olive oil. Let it sit for 3 hours. 2. Once the yeast has bubbled well, take the yeast water in a mixing bowl. Add 2 cups whole wheat flour, 1 teaspoon olive oil, salt and mix well. 3. Knead well and make a soft dough. Let the dough proof for 1.5 hours or until it doubles up in volume. 4. Once the dough is ready, punch it slightly and knead once. Divide the dough into 2 prats. 5. Take one part and roll into thick circle or rectangle. 6. Make dimples all over the rolled bread. 7. Brush the rolled bread generously with herbs infused oil. 9. Once you are ready to bake preheat oven at 220C. Bake the prepared bread in oven for 15-18 minutes or until the edges are crisped and potatoes slightly wilt. Allow to cool for 10 minutes. Serve potato rosemary focaccia warm. 2 teaspoons chopped rosemary sprigs. Take 1 cup luke warm water in a bowl. Add 3/4 tablespoon sugar and mix well. Sprinkle 3/4 tablespoon active dry yeast over it. Let the yeast get activated. In the meantime add 1/2 teaspoon chili flakes, 1/2 teaspoon minced garlic in 3 tablespoons olive oil. Let it sit for 3 hours. Once the yeast has bubbled well, take the yeast water in a mixing bowl. Add 2 cups whole wheat flour, 1 teaspoon olive oil, salt and mix well. Add required water and make a dough. Knead well and make a soft dough. Let the dough proof for 1.5 hours or until it doubles up in volume. Once the dough is ready, punch it slightly and knead once. Divide the dough into 2 prats. Take one part and roll into thick circle or rectangle. Make dimples all over the rolled bread. Brush the rolled bread generously with herbs infused oil. Once you are ready to bake preheat oven at 220C. Bake the prepared bread in oven for 15-18 minutes or until the edges are crisped and potatoes slightly wilt. Allow to cool for 10 minutes. Serve potato rosemary focaccia warm.